Thanks to the Shanghai Expo 2010, Shanghai has a good rail system. Besides taking the cab from Shanghai Pudong International Airport, the best way is to make use of the Maglev Train to Longyang station. Maglev train stands for Magnetic levitation train is notable for being the first commercial high-speed maglev line in the world with the top speed of 431km/h making it the world’s fastest train in regular commercial services since its opening in 2004. The journey only took 8 mins!! Note: Upon arrival to Pudong Airport, follow the signs that lead to the Maglev Train station. When purchasing tickets, show your boarding pass to get a special rate discount. Note: To get a cab from Longyang station, follow the official taxi sign when you exit the station. DO NOT follow anyone to lead you to the taxi stand (usually a rip-off). The official taxi stand is located on the left of the station and make your way down using the escalator. Bund is one of the most famous tourist destinations in Shanghai. The word “bund” means an embankment or an embanked quay. Overlook the bund promenade, just across the Huangpu river, are the spectacular view of the Oriental Tower. A perfect location to take picures especially during the night. Some of the landmark at the bund are custom building(above), bank of china, peace hotel and impressive bronze statue of Chen Yi. Most of the buildings here are inherited from the British colony then. If you wish to see the Oriental Pearl Tower a little bit closer. Take the ride with the Bund Sightseeing Tunnel. Located nearby the Bund just follow the sign and there’s an escalator down to the tunnel. Not to worry, you don’t have to walk thorough the tunnel but a speed train (Above) will bring you all the way 646.7 meters sightseeing tunnel from the Bund in Puxi to the Oriental Pearl TV Tower, Lujiazui area in Pudong. It only takes 3-5 minutes by the speed train through the tunnel with colorful radiating lights around. A 2 way ride will cost 55yuan per person while one way will cost 45yuan. Another option to get to Oriental Pear Tower is using the metro, the nearby stations are: Nanjing Road East (west side of river) and Lujiazui (east side of river). Please avoid using it during peak period. The Oriental Pearl Tower is located at the tip of Lujiazui in the Pudong district, by the side of Huangpu River, opposite of The Bund. It serve as an observatory and TV tower.With the height of 468 meters, is the world’s third tallest TV tower after the 553-meter CN Tower in Toronto and the 535-meter Moscow TV Tower. There are several admission package to choose from but the recommended is 150yuan (including the entrance fee, the Shanghai Municipal History Museum and the upper sphere called space module). Before entering the building, visitors have to go through a security checkpoint. Please take note, NO lighters & water bottle (that is filled with any kind of liquid) are allowed to bring into the tower due to security reasons. A glass floor and wall to view 360 bird’s eye view of Shanghai. Not for those who are afraid of height. The Space module, the highest point for observation area, with a height of 350 meter is the highlight of this tower. View of the Bund promenade from the observation tower. The tower is open from 8am to 9pm. 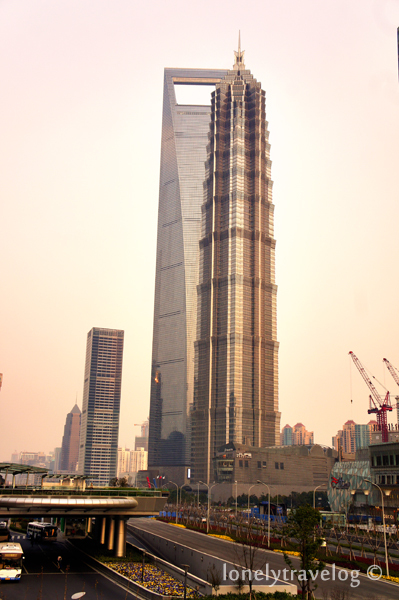 Some of the tallest building nearby, Jin Mao Tower Building (Right) & Shanghai World Financial Center (Left). The old side of Shanghai, Yuyuan Garden Bazaar. Famous old town is well known for its architecture. Believe it or not, most building here is at least 400 years old but thanks to restoration, it looks clean. There are a lot of stores, push carts and yes a department store too. (Above) is the famous old tea house. There are plenty of tea house nearby but most of them sell the same thing. Just beware of scam as they push to sell overpriced tea saying it is natural compared to the one sold in the supermarkets. 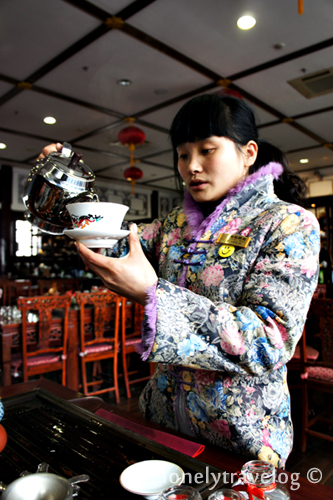 Other than that, you may wish to get a tea demonstration for a small price to taste all the different tea. When you’re at yuyuan, the garden is not to be missed. Follow the signs at it will lead you to the entrance of Yu Garden (above). 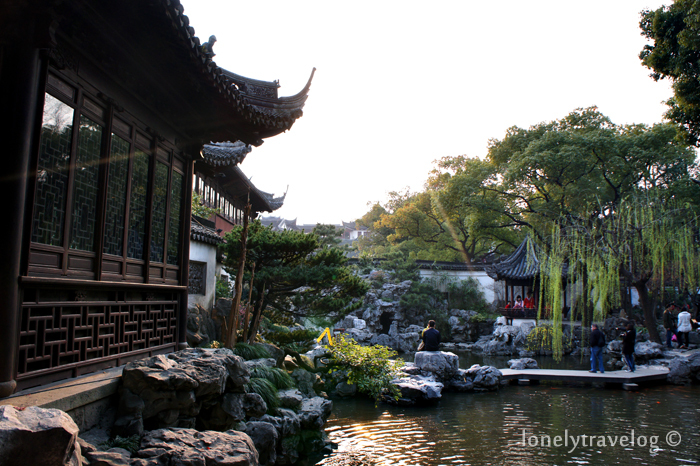 Yuyuan garden is characterized by an exquisite layout, beautiful scenery and artistic architecture. Each pavilion, hall, stone and stream in the garden can express the quintessence of South China landscape design from Ming and Qing dynasties. Open from 8.30am to 5pm. Each adult admission cost 30 yuan. 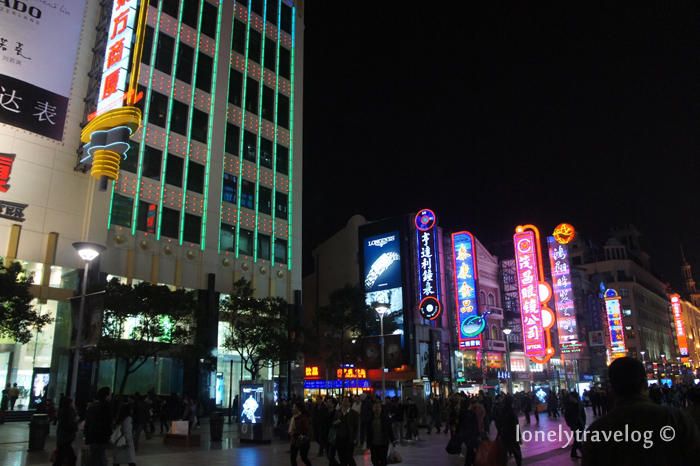 Nanjing Rd Shopping Street. Not to be missed for shopaholics. 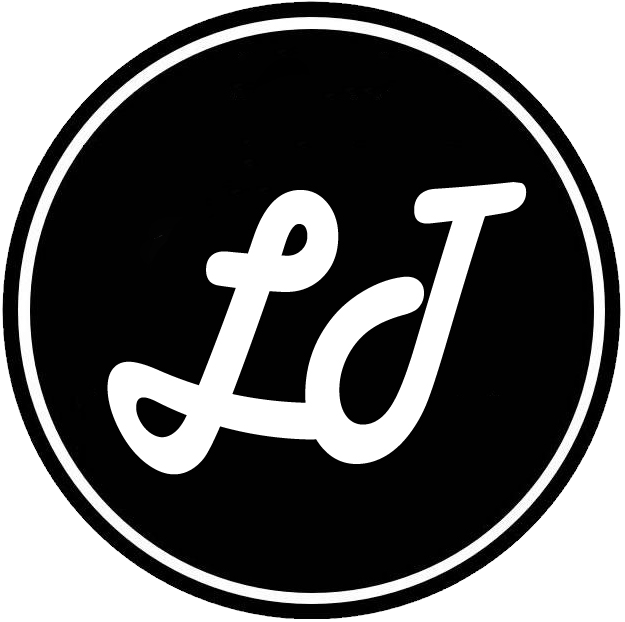 Wide variety of fashion clothings such as Uniqlo, Meter Bronwe, Nike, Adidas and upscale stores. 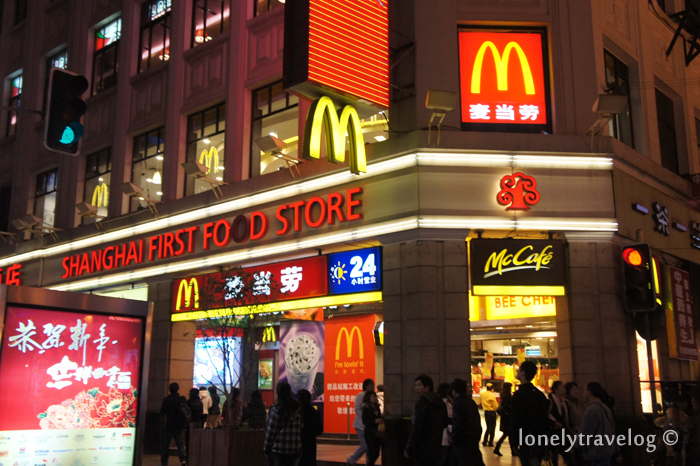 Nearest subway is people’s square. I am just amazed how clean Shanghai is! They really tried to maintain most of the public areas including the toilets. Tired to walking? A trackless sightseeing tram provides a comfortable tour of the night-transformed pedestrian street. Only cost 2 yuan per person for single journey. This tram will bring you from one end to another end of the street. Shanghai Science and Technology Museum. The museum covers an area of 68,000 square meters, a floor space of 98,000 square meters and an exhibition space of 65,500 square meters. You can actually spend here for more than half a day. Getting there is easy, take the metro and alight at Science & Technology Museum Station. One of the galleries called Animal’s World. Wide variety of animal species can be found here. I’m not sure if its a preserved animal but it does sure look so real. Robot & Technology Gallery. 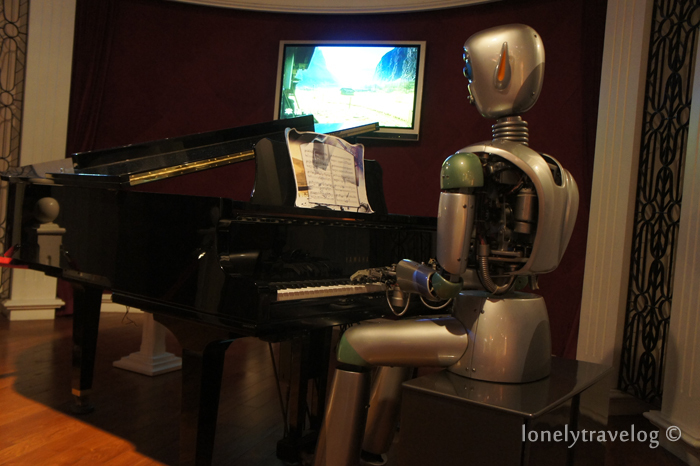 This robot can actually play a simple song with the piano. 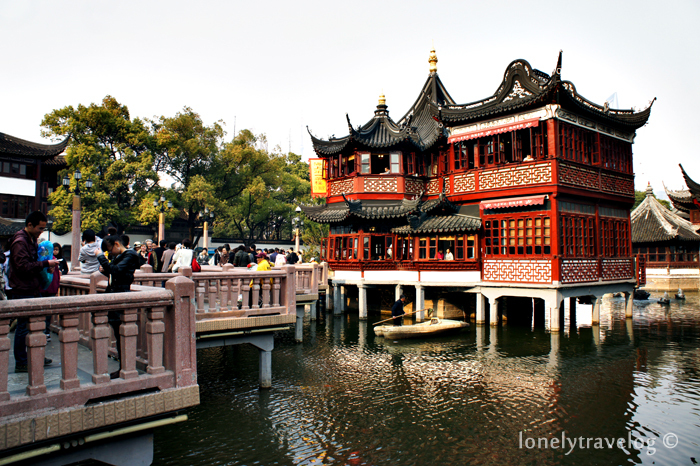 While your in Shanghai, visiting Zhujiajiao Ancient Town is a must! In fact, this is the most interesting place to go. Getting there is easy. First make your way to Shanghai Stadium using Metro. Then at the stadium, search for Gate No. 5. That is where the tourism bus station located. Take note that the bus only depart to Zhujiajiao in the morning as early as 9am. Therefore, plan early to buy the tickets there before hand. Do remember to buy 2 way tickets. Endowed with another elegant name – ‘Pearl Stream’ – the little town is the best-preserved among the four ancient towns in Shanghai. A small admission fee is required upon entrance. It is also called an “Asian Vernice”. Sadly these area has been commercialise to attract the tourist. From eateries, cafe to crafts shops along the alleys. The ancient street filled with representative ancient buildings from the Ming and Qing Dynasties, attracting great numbers of domestic and foreign tourists. Visitors have the chance to ride the boat depending on the length of the journey. The villagers have been depending on tourist for their daily income. Bridges in the town are distinctive and old, built during Ming and Qing Dynasties. This old town is thoroughly connected by 36 delicate spans in different shapes and styles, from wooden to stone to marble. Kezhi Garden. Another Scenic spot in Zhujiajiao. 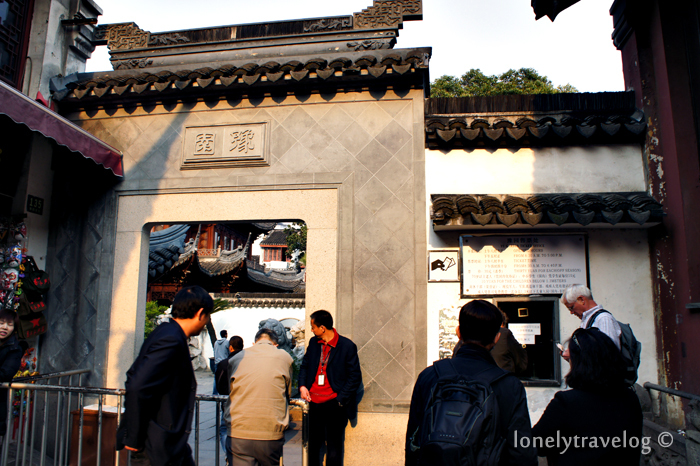 With a small entrance fee, visitors can enjoy the view of the garden built during the Ming and Qing Dynasties. This garden used to be a private garden of a Chinese wealth family. It is a pretty sight! Since I was a kid, Shanghai has left a mark on me. A mark that is equated to longing. Longing to see China where kung fu originated. I am a fan of kung fu movies. And because of those movies, I learned how beautiful the country is. I will never forget that movie Enter the Dragon and that place where House of the Flying Daggers was shot. On the other hand, you made me see a different picture of China here, which is still beautiful. It’s no surprise since they are now the center of technological advancement. Then you must already watched shanghai knight! Yes Shanghai is amazingly clean now. A modern city skyline yet surrounded with olden architecture. I’ve been to almost all those places (not the science museum) but my photos definitely didn’t turn out as well! Ouh such a waste!! I’ve yet to take alook on ur blog. Will do it right after and Thanks for following! Cheers!